Lloyd Rees was a consummate draughtsman of landscape. Many of his finest drawings are in small sketchbooks, of which 19 are extant, all in the Art Gallery of New South Wales collection. The Gallery has the most extensive collection of Rees’s work – paintings, drawings and prints spanning 70 years of his working life. ‘The summit Mount Wellington II’ 1973 is arguably his finest drawing. He certainly valued it highly, as did the artist Kenneth Jack, its only owner before it was purchased by the Gallery in 2009. It was first exhibited at Artarmon Galleries, Sydney and the New Grafton Galleries in London in 1973, and was the poster image for a major survey of contemporary Australian drawings organised by the Art Gallery of Western Australia in 1978 and also shown here and at the Queensland Art Gallery. Mount Wellington dominates Hobart and the Derwent Valley, seemingly changing in mood according to weather conditions and occasionally disappearing from view when shrouded in clouds. 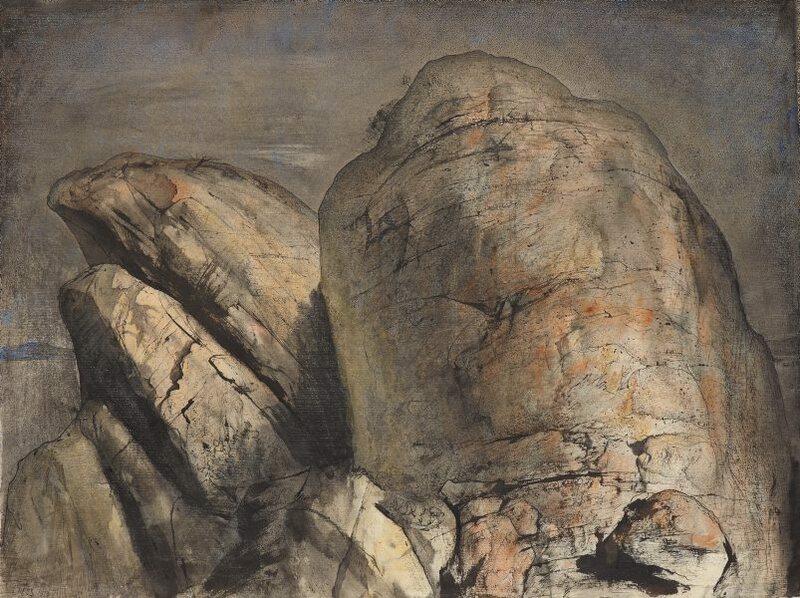 There are many images of it by early 19th-century artists and many since, including countless snapshots by tourists to Tasmania who climb or drive to the top, on a road first built by convicts, to experience the view. After Rees’s son and family first moved to Tasmania to live in 1967, Rees began making his first drawings of Mount Wellington. None, however, are as expressive as this one. Close inspection reveals a rich texture of pen and brush in ink and watercolour, as well as oil pastel (to which Kenneth Jack had introduced him). The bold shapes of the rocks also suggest human form. Rocks held particular significance for Rees, suggesting permanence and acting as symbols for the composition of the earth and its part in the universe. Signed and dated l.l., pen and black ink 'L. REES 1973'.